DESPITE BEING HEMMED IN BY OTHER BUILDINGS, THIS CAPE HOME HAS AN EXCEPTIONALLY SPACIOUS AND AIRY FEEL. 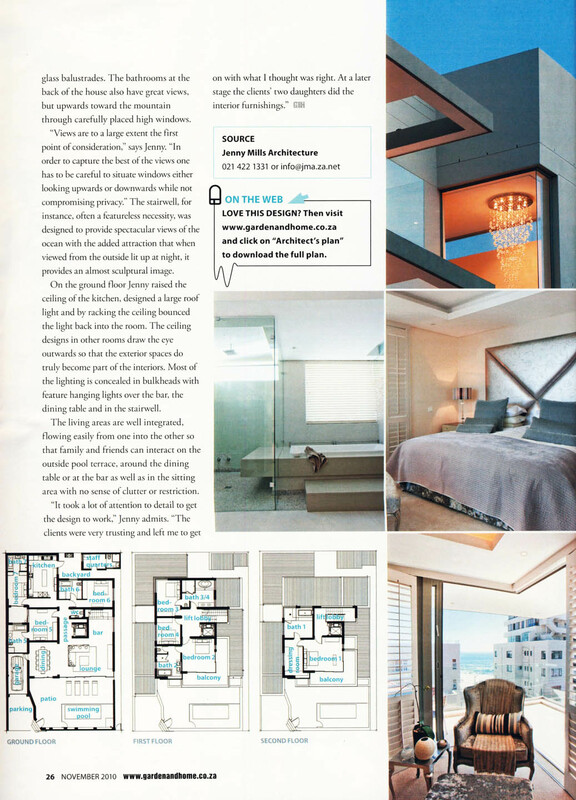 The challenge of modern design is as much about how to make confined spaces work as juggling the arrangement of rooms. 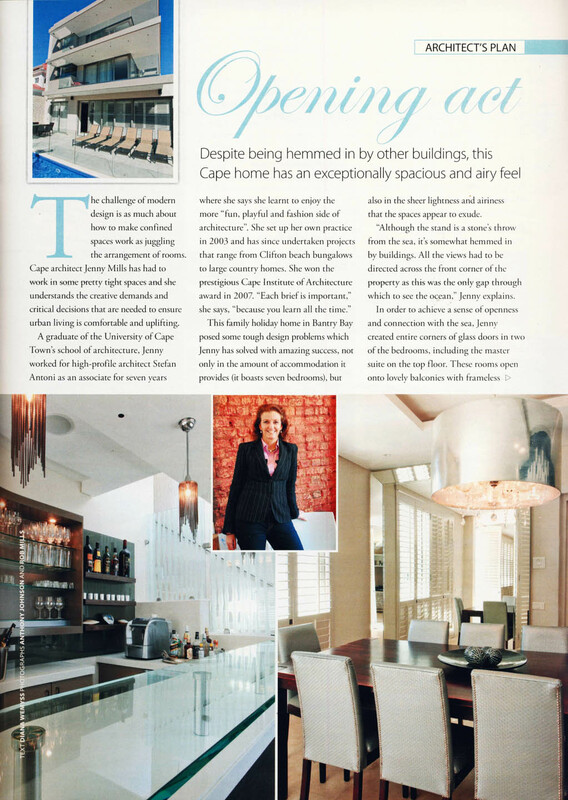 Cape architect Jenny Mills has had to work in some pretty tight spaces and she understands the creative demands and critical decisions that are needed to ensure urban living is comfortable and uplifting. A graduate of the University of Cape Town's school of architecture, Jenny worked for high-profile architect Stefan Antoni as an associate for seven years where she says she learnt to enjoy the more "fun, playful and fashion side of architecture". She set up her own practice in 2003 and has since undertaken projects that range from Clifton beach bungalows to large country homes. She won the prestigious Cape Institute of Architecture award in 2007. "Each brief is important," she says, "because you learn all the time." This family holiday home in Bantry Bay posed some tough design problems which Jenny has solved with amazing success, not only in the amount of accommodation it provides (it boasts seven bedrooms), but also in the sheer lightness and airiness that the spaces appear to exude. "Views are to a large extent the first point of consideration," says Jenny. "In order to capture the best of the views one has to be careful to situate windows either looking upwards or downwards while not compromising privacy." The stairwell, for instance, often a featureless necessity, was designed to provide spectacular views of the ocean with the added attraction that when viewed from the outside lit up at night, it provides an almost sculptural image. On the ground floor Jenny raised the ceiling of the kitchen, designed a large roof light and by racking the ceiling bounced the light back into the room. The ceiling designs in other rooms draw the eye outwards so that the exterior spaces do truly become part of the interiors. Most of the lighting is concealed in bulkheads with feature hanging lights over the bar, the dining table and in the stairwell. The living areas are well integrated, flowing easily from one into the other so that family and friends can interact on the outside pool terrace, around the dining table or at the bar as well as in the sitting area with no sense of clutter or restriction. "It took a lot of attention to detail to get the design to work," Jenny admits. "The clients were very trusting and left me to get on with what I thought was right. At a later stage the clients' two daughters did the interior furnishings." "Although the stand is a stone's throw from the sea, it's somewhat hemmed in by buildings. All the views had to be directed across the front corner of the property as this was the only gap through which to see the ocean," Jenny explains. In order to achieve a sense of openness and connection with the sea, Jenny created entire corners of glass doors in two of the bedrooms, including the master suite on the top floor. These rooms open onto lovely balconies with frameless glass balustrades. The bathrooms at the back of the house also have great views, but upwards toward the mountain through carefully placed high windows.